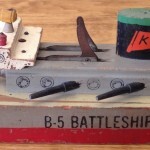 This B-5 Battleship measures 14″ x 3.5″. The stack on this particular ship has the Keystone flag on it which is more often seen on their tug boats. I would need to see a photo or two to give you an idea.